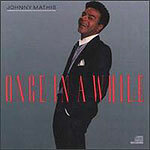 CD review: "Once in a While"
Some people were simply born to sing, and Johnny Mathis has to be counted in that group. The most banal, superficial songs have come alive in the hands of this gifted balladeer. And when given good material, the man is a god. Now in his fourth decade of recording, his newest album finds him in perfect voice and with material enough to show it off. "I'm on the Outside Looking In" is as hook-laden and melodic as his most popular songs from the 1950s and '60s. The sweeping theme and warm arrangement gives his rich voice room to soar. On "Two Strong Hearts," Dionne Warwick joins him for a duet that is the goods. Interestingly, two different sets of producers handled the two sides of this LP. Side one producers Peter Bunetta and Rick Chudacoff keep the arrangements simple and sparse, giving Mathis and his voice the full spotlight. On side two, though, producers Preston Glass and Robert Kraft drown out that gorgeous voice in strings and horns.